What exactly happened to Thranduil's face while he was arguing with Thorin? I found this source but i don't know whether it is what you are after. Thranduil’s sudden scars reflect a little emphasized of Tolkien’s lore: elves’ “Fëar” (a metaphysical concept analogous translatable as “soul”) occasionally influences the “Hröa” (the fleshly, physical body), particularly under moments of extreme stress. This can manifest as extreme physical changes that reflect the mind’s state, in this case deep war scars. Edit : I have also found this reference which seems to state that Tolkien made no reference to the Scars on Thranduil's face in the books. Thranduil's scars are decidedly non-canon. According to Tolkien's texts, the last battle Thranduil saw (up to setting in The Hobbit) was that of the last alliance at the end of The Second Age. However, in the 1900's of the Third Age, according to text, the "serpents of the north" were fought and mostly slain. In all likelihood, Peter Jackson is taking creative liberty with the story. On a more symbolic note, the scars could represent the pain Thranduil has endured in war (he watched his father die in the battle of the last alliance). Thranduil mentions that (Paraphrasing because of memory) "Do not talk to me of Dragon Fire, I have felt is wrath and ruin. I have faced the Serpents of the North". Although I don't think Tolkien made any canon mention of these fights, or none that I've found. I think Peter Jackson did this to add some common ground between Thranduil and the Dwarves that I'm sure will play some part in the third film. I read the Silmarillion many years ago, and I immediately assumed, when Thranduil mentioned the serpents of the north, that PJ concocted a history where Thranduil had a run-in with one of the dragons from Angband somewhere in the First Age, when he still lived in Doriath. It is plausible. I did not think the scars were real; I thought he summoned the memory of the wound and it manifested on his face briefly. But I really think the 'scar' was the illusion, not the reality as so many others think. The book does not refer to any scar or to Thranduil being somehow disabled, but the movie makes it seem so ´cause the Movie!Thranduil has an extensive scar and an apparently blind eye as a result of the scarring (caused by the dragon fire). he battled the dragon, it scarred Thranduil for life, and now he is forced to wear a glamour on his face to hide the ugly mark. But it probably reveals itself after a period of stress or in times of anger. 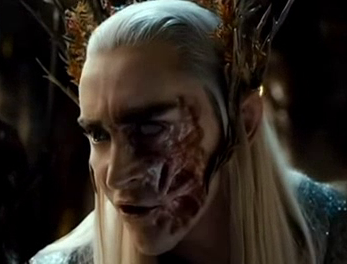 he battled the dragon, it scarred Thranduil for some time, and the resulting mark on his face really did look like this for an unspecific long period of time. However, the scar got already healed somewhere in the past, and now, when it revealed itself again, it must be just a manifestation of the venomous anger that Thranduil holds inside of him. My guess is that PJ took the fear/hroa concept one step further to expose the hubris of Elven arrogance/beauty. Translation: dragon's fire is the one thing elves cannot fully heal and scars permanently. There is a trope common among many fantasy stories that Elves have a special power called Glamour, which is a kind of magical make-up. In the Sandman comics, an Elf girl is given to the Dream Lord, and he tells her that she doesn't need to use her Glamour in the land of Dream; she suddenly becomes much shorter, older, and uglier. I seem to recall something similar in Spencer's The Fairy Queen (the distinction between Elves and Fairies has not always been so clear, cf. Fairies by Brian Froud). Under this interpretation, the scars are real, and Thranduil's normal fair appearance is an enchantment or spell that he casts over himself. I think somewhere along the line Thranduil did face 'the serpents of the North', and instead of his scars appearing in moments of anger he chooses to have them be shown to prove to Thorin of his hardship. Thranduil is a survivor of Doriath, which was destroyed, in part by fire drakes, in 506 FA; it was here that he was burned by a dragon (the 'serpents of the north' he mentions). He hides the burn scars with illusions but they're still there which is why he tells Thorin he knows all about dragon fire. He got burned by one and it was permanent. I'm pretty sure it's in the Simarillion book by Tolkin, the history of middle earth. I think he was scarred by a dragon sometime in the past and that the gems he seeks (which he asks Thorin for in exchange for there freedom) somehow allow a spell of illusion to hide the scar. Watch again and you'll notice he is wearing a ring with a white stone in it... is this the same gem he is seeking? We know that elves are obsessed with outward appearance and beauty... for one to be so scarred would be a terrible thing. Not the answer you're looking for? Browse other questions tagged tolkiens-legendarium the-hobbit desolation-of-smaug or ask your own question. What exactly was Radagast's role among Maiar? What happened to the treasures the “Master of Lake-town” took with him? What exactly happened to Celebrian when she was kidnapped by the orcs? Was there a symbolic reason for Thorin losing his shield in The Hobbit, The Unexpected Journey?